Appearing in early December, Barrel-Aged Legion is not the first foray into barrel aging for the now two year-old Community Beer Company. In the past, the brewery has released limited barrel-aged versions of their spiced winter brew, Regalement, and their award-winning coffee porter, Ascension. This is in addition to Bourbon Barrel Aged Glenstemmons, a somewhat more widely available treatment of a Scotch ale. 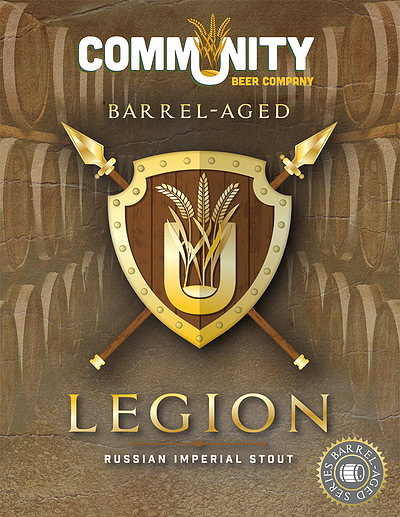 The Legion release, however, represents the first time Community has put out a barrel-aged beer in bottles. It won't be the last either, as additional batches of the Russian imperial stout - aged in various barrels - are expected to be unveiled in the coming months as part of an ongoing Barrel Aged Series to be sold in four-packs. As for this installment of Barrel-Aged Legion, it reportedly spent around four months in barrels obtained from the Heaven Hill Distillery in Bardstown, Kentucky. When brought together with the beer, these barrels impart the expected elements of oak, vanilla and a hint of charred wood, all of which are somewhat subtle on the nose but certainly more forward in the taste. In terms of flavor, the underlying malt complexity comes across as a bit subdued at first, but it's something that opens up considerably as the beer warms. A quick swirl helps as well, revealing notes of licorice, roasted malt, chocolate and dark fruit that seem to intensify with each passing sip. Even so, none of these ingredients take on a position of dominance, leading one to appreciate the overall balance of this slightly full-bodied brew. If anything, chocolate overtones fill the finish, which is otherwise warm and smooth with only faint tannins adding a touch of closing bitterness. Now, as the title above suggests, had this been a review of a tap sample of Barrel Aged Legion, these comments would have been decidedly different. On draft in Community's taproom, the beer was intensely woody with vanilla and oak tannins more or less defining the brew. In the bottle, however, it's an entirely different experience. Blended and balanced are the two words that come to mind first, which falls right in line with what I look for when drinking a barrel-aged beer. Truth be told, I might like the malt to stand up a bit more, but I can also see how others might wish for a bolder boozy tone. Either way, for me the beer is good as it stands now, but it's definitely one worth cellaring to see how it develops over time.